This PolicyWatch is the first in a three-part series on the Red Sea campaign in Yemen. part2 looks at the operational challenges facing the two sides around Hodeida.part examines the Houthis' options for broadening the war if their sea access is threatened. On May 1, the Permanent Representative of Yemen to the United Nations, Khaled Hussein Alyemany, called on the United Nations to seek the handover of the Hodeida port to international supervision. The call came as Yemeni armed forces began new offensive operations to advance 140 km to Hodeida from the north, with Saudi Arabian assistance, and 100 km from the south, with United Arab Emirates support. The parts of Yemen held by the Houthi rebels—also the country's most populous area—are gripped by a severe humanitarian crisis. Even before the war began in 2015, Yemen was on the brink of a humanitarian meltdown, but an analysis of 2017 World Food Programme (WFP) statistics suggests the war has more than doubled the number of food-insecure Yemenis to 17.8 million (64% of the population vs. 31.5% in 2010), including 7 million (25.1% vs. 11.8% in 2010) who are assessed to be severely food insecure. Key reasons for the crisis include the collapse of the government payroll inside Houthi-held areas since 2015; Houthi taxation of food entering its areas, as documented by the UN Panel of Experts; and a shortfall of food reaching Yemen via Hodeida, the port closest to the Houthi areas. (As recently as May 2016, Hodeida imported 543,782 metric tons [MT] per month, and in Q1 2018 the monthly average was just 151,917 MT). As a battle for Hodeida looms, the key question for U.S. policymakers is whether the port's liberation will make the humanitarian situation better or worse. In an effort to improve data-led understanding of this issue, the author undertook a survey of Gulf coalition, U.S., and British government as well as NGO metrics on imports via Houthi-held ports, government-held ports, government-held land borders, and airports. The coverage period focused on the first quarter of 2018, including detailed records of 428 vessels unloaded at six ports (Hodeida, Aden, al-Mukalla, al-Salif, Nishtun, and al-Shihr); land border inflows via al-Wadiah and al-Khadra (on the Saudi border) and Shahan and Serfit (on the Omani border); plus aerial deliveries via Marib. Food and fuel deliveries to Yemen rely almost entirely on seaports. The Gulf coalition's Yemen Comprehensive Humanitarian Operation (YCHO) Support Center data seen by the author suggests that 4,757,797 MT were delivered to Yemen in Q1 2018, but only 158,870 MT (3.3%) came in through land crossings and a negligible 292 MT entered via the civilian air bridge to Marib. (Ship manifests describing the metric tonnage of inbound ships are often erroneous, in part because a fraction of food is diverted through corruption before it reaches Yemen. However, assuming such loss is roughly equivalent across ships heading to all ports, the proportional balance between the ports should still be meaningful.) The breakdown of food imports by sea provided by the YCHO underlines the critical role of the Houthi-held ports. Houthi ports.Yemen's first deepwater port, Hodeida remains a critical entry point for food, receiving 455,751 MT in Q1 2018. Al-Salif, the other Houthi-held port, brought in an additional 182,403 MT in Q1 2018. Combined, the YCHO says the Houthi ports unloaded 638,154 MT of food during the quarter. As a benchmark, UN Verification and Inspection Mechanism for Yemen (UNVIM) statistics say that 672,555 MT of food were landed from ships that "discharged and sailed" at Hodeida and al-Salif, a higher but roughly comparable figure. Government-held ports.Only two government-held ports bring in considerable amounts of food: Aden (255,626 MT in Q1 2018) and al-Mukalla (68,310 MT). Combined, these welcomed 323,936 MT during the quarter, amounting to just 50.7% of the food imports delivered via Houthi-held ports. Overland import of food by truck via government-held areas brought in an additional 107,782 MT in the first quarter, including 72,738 MT through the Saudi border crossing at al-Wadiah. What this all means is that the YCHO is not yet, as billed, a viable way to replace Hodeida and al-Salif as a food-import hub. If anything, the strengthening of government-held ports has benefited fuel imports (751,173 MT in Q1 2018 vs. 540,964 MT unloaded at Houthi ports) and especially consumer goods (1,377,501 MT in Q1 2018, according to YCHO, an order of magnitude higher than the 9,474 MT imported at Houthi-held ports). At present, therefore, no real prospect exists for replacing food inflows from Hodeida and al-Salif: other ports like Aden are too distant from Houthi-held population centers, are importing too little food owing to corruption and inefficiency, and are themselves vulnerable to local instability. When Red Sea ports were temporarily closed in November 2017, the WFP recorded a sharp 10% rise in food prices in December and a subsequent 6% rise the following month due to price gouging and hoarding, even though the ports were quickly reopened to shipping. The local food supply in Hodeida itself, a densely populated city that probably tops 700,000, might fail disastrously during a battle. However, inaction at Hodeida carries steep costs. As long as the port is under Houthi control, food merchants and shippers will not return because they fear onerous paperwork, slow turnarounds, war risks, and Houthi taxes. If liberated, the port's capacity could quickly be expanded, especially if the liberation is achieved quickly and carefully. People in government-controlled areas are better off than people in Houthi-controlled areas precisely because they are reconnected to functioning ports and, partially, to the government payroll system. Thus, the people in Hodeida would benefit from being liberated. They also want to be liberated because the Houthis are not local to their area, whereas advancing Yemeni forces include large numbers of Red Sea troops. Finally, the Yemeni government and Gulf coalition are more likely to engage in good-faith peace talks if they do not fear a Houthi ministate connected to Iran by sea. As well as reducing the likelihood of famine, the United States must focus on ending the war in Yemen, which is a costly and damaging distraction for U.S. allies in the Gulf. But neither the Yemen-Saudi-UAE alliance nor the Houthis are likely to abandon their intensifying competition over the ports. The war is inexorably creeping closer to Hodeida every day. Washington has three options. Option 1: Freeze Red Sea military movements but offer no solution. The worst option would be for the United States to continue its behind-the-scenes opposition to a decisive UAE-led military operation to liberate Hodeida and the Red Sea coast, while at the same time offering no alternative. This option may appeal to some because it incurs no direct U.S. costs or obligations, but it is only likely to prolong the war and humanitarian suffering. 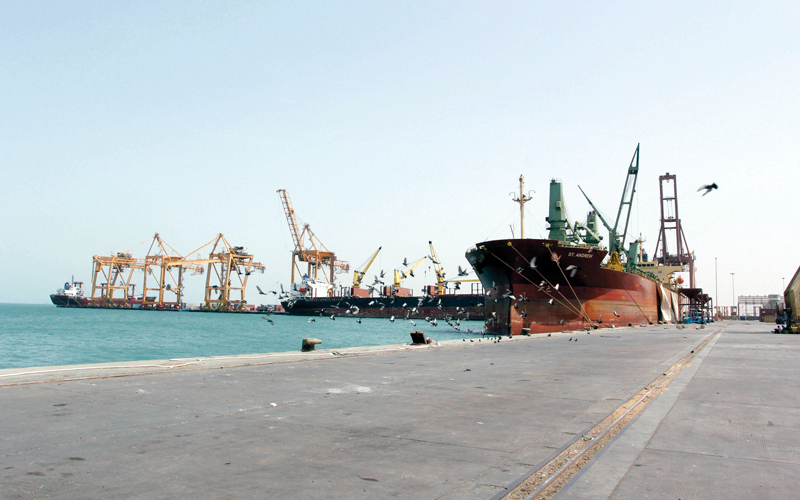 Shippers and merchants will continue to avoid Hodeida until the port's future is resolved. The Gulf coalition will creep toward the ports, as is occurring now, because it probably cannot support any peace deal in Yemen that leaves the Houthis as a proto-Hezbollah entity with direct maritime access to Iran, and because an offshore inspection regime for shipping has proved unworkable. This "circling the drain" option has essentially been U.S. policy for much of the last two years, and it has only served to prevent Hodeida from reemerging as Yemen's strongest food-import hub. Until the Houthis are removed from Hodeida, where they extort and mismanage the port, it will never come back online at the necessary capacity to feed northern Yemen. Option 2: Demilitarize the Houthi Red Sea ports.The best-case scenario might be demilitarized Red Sea ports under the control of international agencies and local Yemenis—the so-called Hodeida initiative, which Yemen once again raised on May 1. If Hodeida were demilitarized, a range of positive steps could be attempted. Damage to the port might be avoided entirely; the Gulf coalition could issue long-term guidance to shipping operators and food merchants indicating that the port would remain open; insurance costs might decline if the port's security were underwritten by international actors; and the port might quickly return to prior import levels—which frequently topped 1.6 million MT per quarter, according to UNVIM. As long as al-Salif is included, the Gulf coalition will probably be willing to consider this outcome, because it will allow more-effective and less-controversial onshore inspections of cargoes, greatly reducing coalition fears of Iranian missile resupply through the port. The United States could signal to the international community that this is probably the last chance to avoid military operations to liberate the port and that Washington will not be able to dissuade Yemen and the Gulf coalition from launching a decisive operation absent immediate diplomatic progress on Hodeida. Option 3: Support rapid liberation of the ports. If the international community fails to embrace the Hodeida initiative, this summer will witness intensified military operations near Hodeida and al-Salif. In light of such a development, U.S. interests will arguably shift: the fighting must be as short, clean, and decisive as possible. "Scorched earth" sabotage tactics and collateral damage must be kept to an absolute minimum (as will be discussed in Part 2 of this series). If a battle is launched for Hodeida, the United States might view the liberation of the port as the best way to save lives in Yemen by shortening the war and processing more goods because of the greater efficiencies of inspecting cargo on shore. Drawing on defensive authorities to protect Gulf allies and global sea-lanes, the U.S. support could be limited to passive measures such as the detection of Houthi missile launches plus Houthi naval mines and antishipping attacks on the Red Sea coast. Support from multinational naval escorts and merchant ships that carry inbuilt cranes could quickly turn Hodeida back into a functioning container port. In return for its strong backing, Washington should extract ironclad "prenuptial" guarantees from Saudi Arabia and the UAE that upon the liberation of Hodeida and al-Salif, the Gulf coalition would support an immediate ceasefire with the now-landlocked Houthis and lend support to the UN mediation process. *Michael Knights, a senior fellow at The Washington Institute, recently returned from a visit to Yemen and the Gulf coalition states, where he received detailed data on Yemeni food, fuel, and other imports.